Preheat the oven for 375˚F/190˚C. 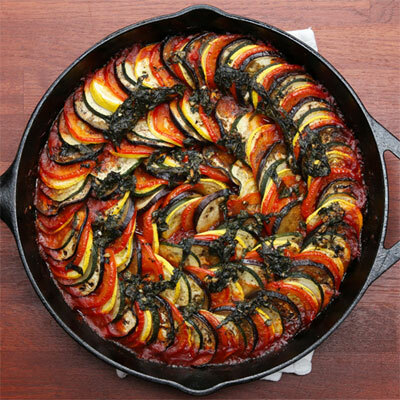 Slice the eggplants, Roma tomatoes, squash, and zucchini into approximately 1/16-inch rounds, then set aside. Heat 2 tablespoons of olive oil in a 12-inch oven safe pan. Sauté onions, garlic, and bell peppers until soft. Season with salt and pepper, then add crushed tomatoes. Stir until ingredients are fully incorporated. Turn off the heat, then add basil. Stir once more, then smooth the surface of the sauce with your spatula. Arrange the sliced veggies in alternating patterns, (e.g. eggplant, tomato, squash, zucchini) on top of the sauce from the outer edge to the inside of the pan. Season with salt and pepper. Mix herb seasoning and pour over the vegetables. Cover the pan with tin foil and bake for 40 minutes. After 40 minutes, uncover, then bake for an additional 20 minutes. The vegetables should be soft. Serve while hot as a main dish, or as a side dish. The ratatouille is also excellent the next day.